I think it is fair to say that this past week we had a fantastic Parish Mission with Fr Leo Patalinghug. How many of you got to see him? All 3 days? Personally it was great to see this sanctuary filled to capacity for such an event! If you missed these evenings, do not despair, because for the last few days I have been trying really hard to come out with a way to share the message of these 3 days and I think I figure a way to do this. 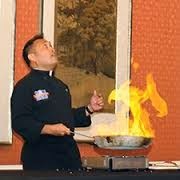 Sadly, if I want to keep my homily under 10 minutes, unlike Fr leo, I will not be able to show my own cooking skills… If I were to compress Fr Leo’s message into one easily digestible idea, believe or not, I can do this with just one word “metanoia”. Now this Greek word is not an easy word to translate into English. In today's readings this word is translated as “repent!” or “repentance” In fact, it is no accident that we hear this word twice in today’s readings, since it is a word used often by the Lord and the apostles. Now, we know that “repentance” is an action we take after we have already done something wrong. It is the result of regret and guilt, and it involves our commitment to do something to repair the damage we have done. However this is not what Metanoia actually means. In fact this is not one word but a combination of two words; the first, “meta” is the name of the markers used in a racetrack to indicate where the runners had to turn, and “noia” which means to have mental knowledge (noia-Know), so this word literally means “To know where are we supposed to turn”. So when in today’s two readings St Peter says “Repent that your sins may be forgiven” and the the Lord says in the Gospel “repentance would be preached in his name” they are not talking about feeling sorry for our sins but they are encouraging us to open our eyes and realize we need to turn our way of live around, from what was before into completely new direction. If you think about it, this is the same message Fr Leo brought to St Michael’s this past week. The first night he spoke specifically to our young people. He talked about how easy it is to sin and how difficult is to be good, and he demonstrated how in a group once one member decides to turn around and do good, this decision affects the whole group. All it takes is for one person to engage in this reorientation of one's life. The second night he dedicated to our Blessed Mother. He used her as an example of faith and trust. Turning around our lives will always be a scary process, because we really have no idea where the Lord is going to take us. Mary could not have known how much her life would change after finding herself as an unwed-mother and later as Simeon told her that “a sword would pierce her heart”. As scary of these things sound, she trusted God’s word, and always was open to God’s plan for her. On the third night Fr Leo showed us how we do not have to turn around our lives alone, how we have the sacraments especially reconciliation and the Eucharist to support us and guide us in this process. Metanoia could be a scary thing, it is very easy to fool ourselves by thinking that we do not have to reorient our lives, it is very easy to lie to ourselves and to others making them and us think that we are OK. But the key is to make sure we are following Jesus commandments. And what is the easiest way to do this? By engaging in what the Church calls and “examination of conscience”. Now I have no time to tell you how to do a good examination of conscience, but there are some good resources online to guide you on this, and you can always make an appointment with a priest and he will help you. The point is, we all need to do this periodically if we want to follow the message of metanoia, of transformation and reorientation of our lives. I think last week’s mission was a complete success, but now it is up to us to built on what Father Leo accomplished, to take a good look at our lives and re-orient our whole being. Because when we do this, to use again the words of St John in the second reading “the love of God will be truly perfected in us.” God bless you.